Rhizomes 3-10 mm diam. Culms cylindric, 0.5-3 m × 2-10 mm. 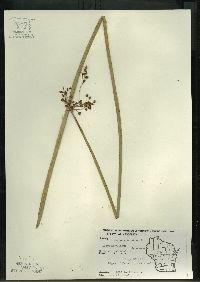 Leaves 3-4, basal; sheath fronts membranous-translucent, often pinnate-fibrillose; blades 1-2, C-shaped to dorsiventrally flat in cross section, usually much shorter than sheath, distal blade 2-200 × 1-4 mm, margins often scabridulous. 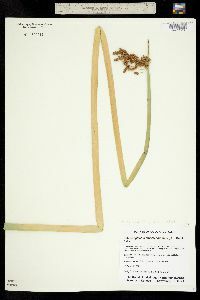 Inflorescences 2-4 times branched, branches to 15(-25) cm; proximal bract usually erect, thickly C-shaped to subterete, 1-8 cm, margins sometimes scabridulous. Spikelets 15-200, solitary or in clusters of 2-4(-7), commonly all solitary, 3-17 × 2.5-4 mm; scales uniformly dark to pale orange-brown, sometimes straw-colored, sometimes prominently lineolate-spotted, midrib often pale or green, ovate, 2-3.5 × 1.5-2 mm, sparsely (rarely densely) reddish or straw-colored, scabrous on awn and distal parts of midrib and sometimes flanks, margins ciliate, hairs contorted; flanks veinless, apex obtuse to rounded, notch 0.2-0.3 mm deep, awn straight or bent, 0.2-0.8 mm. 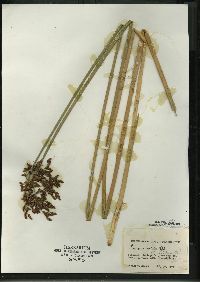 Flowers: perianth bristles 6, brown, ± equaling achene, densely retrorsely spinulose; anthers 2 mm; styles 2-fid, sometimes 3-fid near spikelet apex. Achenes dark gray-brown when ripe, plano-convex, obovoid, 1.5-2.8 × 1.2-1.7 mm; beak 0.2-0.4 mm. 2n = 42. Fruiting late spring-summer, spring-winter (south). 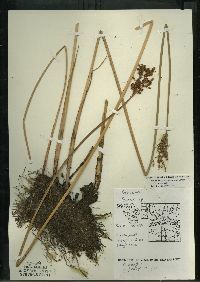 Fresh to brackish marshes, fens, bogs, lakes, stream banks and bars, pioneering in disturbed places, often emergent in water to 1 m; 0-2400 m; Alta., B.C., Man., Nfld. and Labr., N.W.T., N.S., Ont., P.E.I., Que., Sask., Yukon; Ala., Alaska, Ariz., Ark., Calif., Colo., Conn., Del., D.C., Fla., Ga., Idaho, Ill., Ind., Iowa, Kans., Ky., La., Maine, Md., Mass., Mich., Minn., Miss., Mo., Mont., Nebr., Nev., N.H., N.J., N.Mex., N.Y., N.C., N.Dak., Ohio, Okla., Oreg., Pa., R.I., S.C., S.Dak., Tenn., Tex., Utah, Vt., Va., Wash., W.Va., Wis., Wyo. ; Mexico; West Indies; Central America; s South America; Eurasia; Africa; Pacific Islands; Australia; New Zealand. Two yellow-striped forms of Schoenoplectus tabernaemontani are grown as ornamentals. 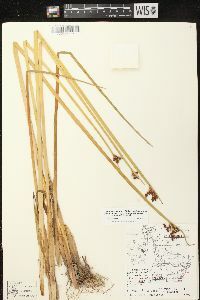 Schoenoplectus validus, described from the Caribbean, and S. tabernaemontani, described from Europe, are here treated as one variable, cosmopolitan species without infraspecific taxa, pending further studies (J. Browning et al. 1995b; S. G. Smith 1995). 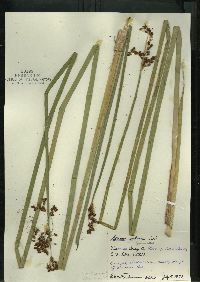 Most North American plants have spikelets with reddish papillae or prickles on the scales, whereas some plants of coastal and boreal North America closely resemble most plants of northwestern Europe and southern Africa in their densely reddish prickly-papillose scales and are similar to the type of Scirpus glaucus J. E. Smith. 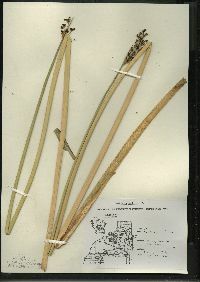 Schoenoplectus tabernaemontani, S. acutus, S. heterochaetus, S. lacustris, and S. triqueter belong to the very difficult S. lacustris complex. 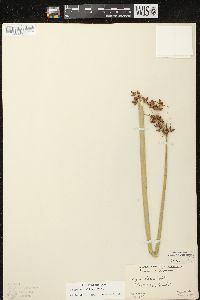 The entire complex except S. triqueter was treated as the single species Scirpus lacustris (T. Koyama 1962b). 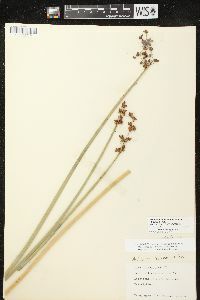 Many Old World authors treat Schoenoplectus tabernaemontani as S. lacustris var. tabernaemontani or subsp. glaucus. 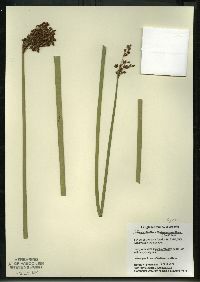 Much of the local infraspecific variation in the Schoenoplectus lacustris complex is probably because of hybridization. Some studies support the recognition of separate species in this group (J. Browning et al. 1995b). 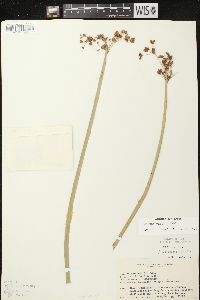 Hybrids in North America include S. acutus × S. tabernaemontani, widespread and common, especially in the east; S. acutus × S. heterochaetus = S. ×oblongus (T. Koyama) Soják, widespread but uncommon; S. heterochaetus × S. tabernaemontani = S. ×steinmetzii (Fernald) S. G. Smith, eastern and most uncommon; S. tabernaemontani × S. triqueter = S. ×kuekenthalianus (Junge) Kent, lower Columbia River in Oregon and probably Washington; and S. acutus var. occidentalis × S. californicus, local in California. 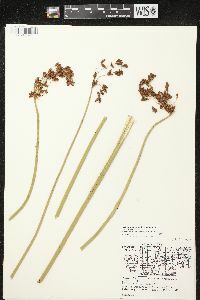 Except for its trigonous culms, S. triqueter is very similar to the S. lacustris complex and freely hybridizes with S. tabernaemontani, both in North America and Europe. 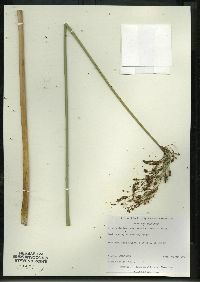 Perennial herb with 3 - 10 mm wide rhizomes 0.5 - 3 m tall Leaves: basal, three to four. Sheath fronts membranous and translucent, often bearing pinnate fibers. 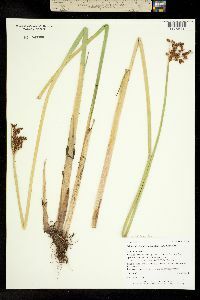 Ligules membranous. Blades one to two, 2 mm - 20 cm long, 1 - 4 mm wide, often much shorter than sheath, C-shaped in cross-section to flat, parallel-veined. 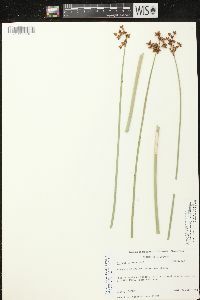 Inflorescence: composed of fifteen to two hundred spikelets, terminal, branched, open, subtended by bracts. 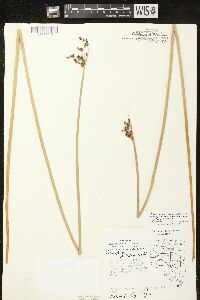 Lowest bract often upright, 1 - 8 cm long, thickly C-shaped to nearly circular in cross-section. Flowers: minute, subtended by a floral scale, lacking sepals and petals, bearing six bristles. 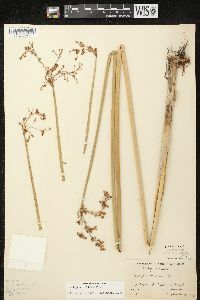 Bristles brown, more or less equal to achene, strap-like, bearing many small spines. Stamens three, exserted. Anthers 2 mm long. Pistil one. Style linear, two-cleft, sometimes three-cleft. Fruit: a one-seeded achene, becoming dark grayish brown, 1.5 - 2.5 mm long (including beak), 1 - 2 mm wide, reverse egg-shaped, beaked, flat on one side and convex on the other. Culm: soft, 0.5 - 3 m long, 2 - 10 mm wide, circular in cross-section, solid, internally spongy with air cavities. 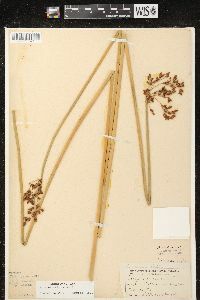 Spikelets: solitary or in clusters of two to seven (usually all solitary), 3 - 17 mm long, 2.5 - 4 mm wide, circular in cross-section, with eight or more floral scales. Floral scales spirally arranged, orangish brown to straw-colored with a pale or green midrib and sometimes tiny lines or spots, 2 - 3.5 mm long, 1.5 - 2 mm wide, egg-shaped with a rounded and notched apex, awned, minutely hairy-fringed. Habitat and ecology: Common in marshes. Also found in the shallow water of streams and ponds. Etymology: Schoenoplectus comes from the Greek words schoinos, meaning rush or reed, and plectos, meaning twisted, plaited, or woven, referring to the use of the culms for making useful objects. Tabernaemontani is named after Jacobus Theodorus Tabernaemontanus, who died in 1597. 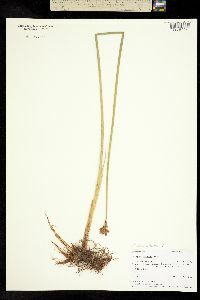 This species grows in sandy or mucky soil in shallow water (usually 1-4 feet deep) in lakes and along streams. It is usually found in every lake of the state and when a lake begins to dry up it usually is the first species to occupy the area. 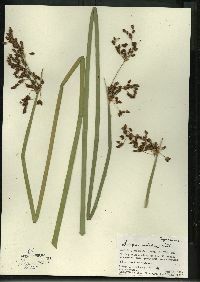 Similar to S. acutus, avg smaller and more slender, the stems soft, easily crushed between the fingers; infl tending to be looser and more open, with longer, laxer, sometimes drooping rays, some of the spikelets often borne singly; spikelets avg smaller, seldom over 1 cm, more shining and reddish-brown; scales mostly (2-)2.5-3(-3.5) mm, with a brown or tawny ground-color, so that the striolae are not usually prominent at 10׬ the awn-tip ±straight, under 0.5 mm; achenes 1.8-2.3 mm, not wholly concealed by the scales; 2n=42. Marshes and muddy shores of lakes and streams, tolerant of alkali; widespread in temperate N. Amer. and s. into tropical Amer. Fr June-Aug. (S. steinmetzii) Perhaps properly to be included in the Eurasian sp. 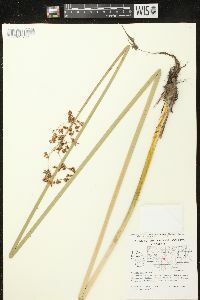 S. tabernaemontani C. C. Gmel. or a broadly defined S. lacustris L.